When working in the writing room, content writers can preview their new content on their website without having to publish it. This page assumes that you have already included the prismic-vue plugin and are using Vue Router in your project, or that you are working with the Prismic Vue.js starter. Check out the Integrating with existing project page to learn how to get setup. If you are using our official Prismic vue.js plugin (prismic-vue), then that is all you need to do to gain the basic functionality of the Preview feature! If you are not using this kit to make your queries, then refer to the "Use the correct ref" section below. Using the official Prismic Vue.js starter? 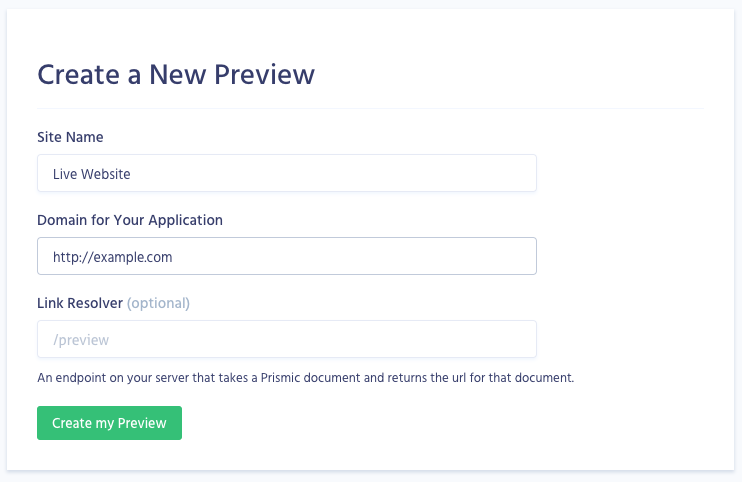 If you are using the official Prismic Vue.js starter, then you should already have all the code in place you need for in-website previews. That's as much as you need to do! Now you need to add the Link Resolver endpoint route to your website router. In the Prismic Vue.js starter you will find this route in src/router.js. Note that the previewSession method requires you to input a Link Resolver function so that the preview endpoint knows where to redirect to. You can learn more about link resolving by checking out the Link Resolving page. You should already have the Link Resolving function in place if you have followed the Integrating with existing project page or are working with the Prismic Vue.js starter. To learn more about how to preview a document, check out the user guide.